Disney Hipster Blog's series have changed over the years, which I think makes a lot of sense. As our interests in the parks change, presumably our content would shift as well. 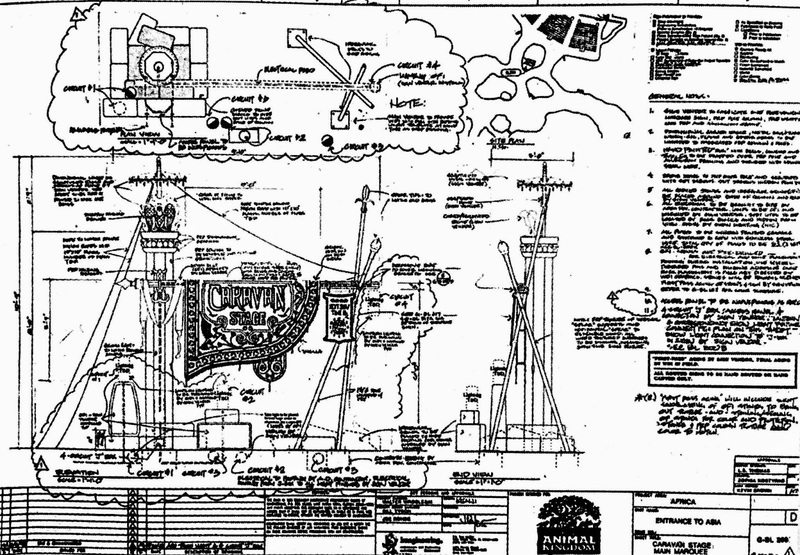 After the recent bungling of Princess Fairytale Hall's marquee I have become pretty obsessed with comparing concept art to the actual implementation of tangible objects in the park. Hence our new series Concept Vs. Reality. 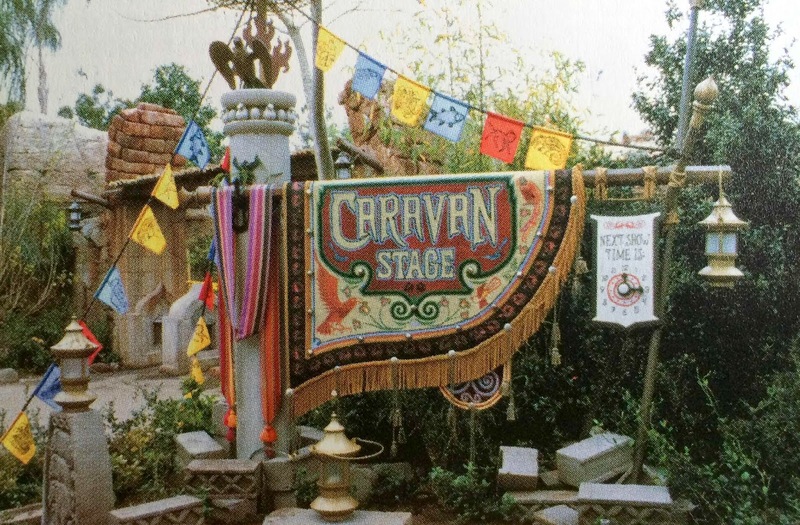 For our first post we're looking at the Caravan Stage marquee. This stage hosts Flights Of Wonder near the outer reaches of the Asia section of the park, moving toward Africa. This long running bird show is needlessly corny, but also pretty amazing. If you haven't seen it I highly recommend it. These images are from The Making of Disney's Animal Kingdom Theme Park and show a terrific instance where concept is translated pretty flawlessly. The marquee is very busy by nature, but features the information upfront. Beyond the actual information, the marquee features a bird motif throughout, hinting at the show found within. Notice the eagle on the pedestal as well as the birds on the rug. The sign also features a few pretty standard Disney "tricks." The poles tied together with worn rope, and hanging lanterns are used extensively in any area where a rugged appearances is needed. For instance, this sign would fit perfectly in Advantureland. There are a few noticeable differences in the final outcome. The most obvious is the showtime signage. While the concept art is much more aesthetically pleasing, the one implemented probably makes more sense in the long run and is more effective in directing people inside for the upcoming show. Less immediately evident, but further away from the concept is the pole size. The concept features very elegantly placed poles, delicately resting against each other. While very beautiful, there is no way this sign would withstand hurricane strength winds…especially with the rug acting as a build in sail. The column was widened as well to match the scale of the poles. The signage was meant to last up to ten years in the Florida sun, while the prayer flags are swapped out every two or three years. This is a great example of how to implement concept art. Certainly things have to be changed in order to survive in the real theme park landscape. However, compromises can be made without destroying the intent of the artist. 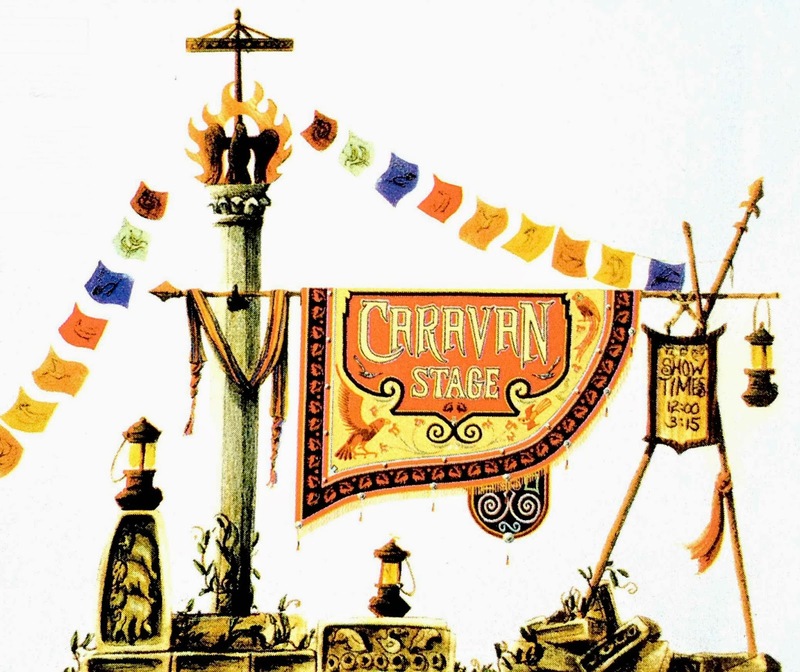 The Caravan Stage marquee is a dynamic sign that does its job wonderfully.